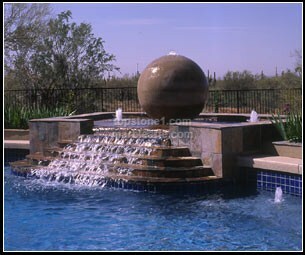 Description: Does your pool fountain look in dire need of a water feature ball? Well here’s your chance to invest in one-of-a-kind decorative marble balls. Basically this marble sphere water feature comprises of an adorning marble sphere as its main asset with many features like the rotating ball fountain, floating ball water fountain, sphere water fountain outdoor, rolling ball water feature and rolling marble fountain to play upon. You may choose from this vast variety for that perfect water feature for your pool. If you are unsure of what best marble water fountains to go with, try the simple alluring designs of the sphere water fountain outdoor like the rotating ball fountain, rolling ball water feature or a floating ball water fountain for an instant transformation. PPPsphere02 - A pool fountain is worth investing in from water feature supplies. With pool fountains, you can never go wrong, either from choosing a marble ball, stone water features, sphere fountain ball, floating stones, or even pool fountains and waterfalls and a floating fountain; all of which make great water features for pools. So get shopping for a great pool fountain today.